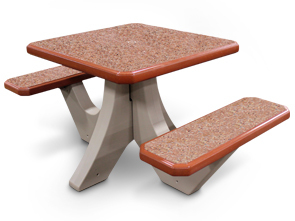 Enhance your outdoor eating area by creating an inviting atmosphere with pre-cast concrete tables. 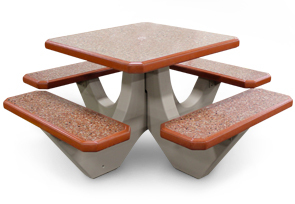 These uniquely designed tables are theft resistant, long lasting and easy to maintain. Wheelchair access picnic tables conform to latest ADA specifications. 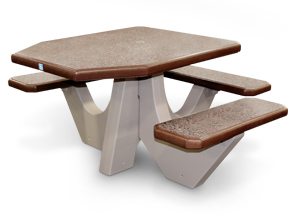 The three seat table has an overhang specifically designed for comfortable wheelchair access. The two seat table is not considered ADA accessible. Made of solid, steel-reinforced concrete that meets ASTM specifications. 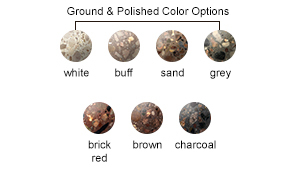 Tables are permanently colored with inorganic pigments and protected with an acrylic sealer. All tables include an umbrella hole knockout plug located in the center of the table. The tables are constructed as not to require an additional umbrella stand. Do not place this product on any surface that will flex or move, these tables must be placed on a flat surface such as concrete.